Meretz MK Michal Rozin defends Ayelet Shaked against sexist remarks, but outright attacks her plans for the Justice Ministry. Recently appointed as Justice Minister, Ayelet Shaked had a strange defender on Thursday morning - Meretz MK Michal Rozin. In a wave of responses to Shaked's appointment, former infrastructure minister Yosef Paritzky (Shinui) took the the conversation on a sexist bent, writing on Facebook: "Wow...for the first time in Israel, the Justice Minister can star as a pinup on a garage calendar." Rozin quickly condemned Paritzky's statements, writing, "the collection of misogynistic and irrelevant responses following Ayelet Shaked's appointment as Justice Minister, mainly the miserable remarks of former minister Paritzky, are not only chauvinistic and show contempt for women, but also hurt the legitimacy of the important criticism being leveled against her appointment." On her own Facebook page, Rozin provided a slightly more nuanced opinion of Shaked's appointment, expressing concern for the future of the Justice Ministry and the High Court. "I believe the designation of this minister is to defend and strengthen the office to which he or she was elected. Ayelet Shaked strives to do that exact opposite with the Justice Ministry: she threatens to weaken the judicial system, to resist binding High Court rulings and to fundamentally undermine the balance of power between authorities." 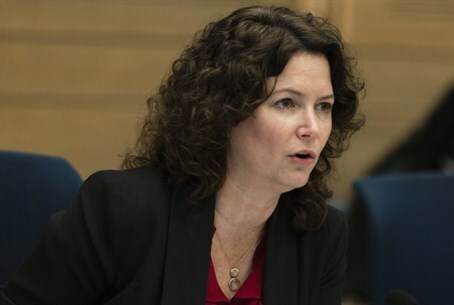 Continuing her sharp attack on Shaked, Rozin describe the new minister's appointment as "a significant step in the process of the religious, messianic, settler Right to take over the establishment and the heart of the Israeli consensus." "Shakes is going and taking her place in the pantheon of the extreme right and represents an ideology where her own racism doesn't embarrass her, and she has made her fame by pushing a bill aimed at annexing the territories, silencing leftist associations, and establishing the supremacy of the Jewish people in Israeli legislation." "There is no lack of legitimate reasons to criticize Shaked and the extreme right-wing government established yesterday. It's unfortunate that much of the criticism leveled at Ayelet Shaked is not at all relevant and is simply pure chauvinism," Rozin added.